If you go to The Beer Yard in Wayne, PA looking for a burger, you are out of luck. The mythical Troegsburger has come and gone. Like nomads arriving at an oasis in the desert, the Troegs brothers pulled up yesterday, loaded with beer and burgers and before anyone knew it, they were gone. So, in a sense, reviewing a burger that you cannot get seems cruel, but I’ll go on for the sadists among you. Word came down via the Beer Yards eNewsletter that the caravan would be arriving Friday for the tasting (beer & burgers) and my mind was made up. First, Troegs beer is ridiculously good. From my favorite brew, the Nugget Nectar (which was the perfect compliment to a burger I recently enjoyed at World Cafe Live) to the Sunshine Pils (which you can get at Phillies games!! ), Troegs handcrafts great beer with an emphasis on freshness (which means you might just have to come to PA to try it). This is quality beer made by people who truly care about taste. The beer alone would have been enough, but the email included a note saying that the Troegs brothers would be bringing burgers, and not just any old burgers. These burgers were made from cows that have grown up eating spent grains from the brewery. Yes, the perfect marriage of great beer and G-d’s greatest food, the burger. I forgot to ask if the cows received daily massages, which would vault the meat into the realm of Kobe/Waygu, but there was no shortage of great flavor – massages or not. Tons of people showed up (including Joe Sixpack) for the event and we grabbed a few beers before heading to the burger queue. After a short wait we got our hands on the mythical burgers and…WOW! First of all, there is something to be said for a burger that has completely avoided the mass meat prouduction/processing system. Nothing good is ever added to the equation when meat comes out of one of these plants. These burgers went straight from the farm to the freezer (ok, would probably have been better without freezing, but that isn’t always realistic) to the grille. 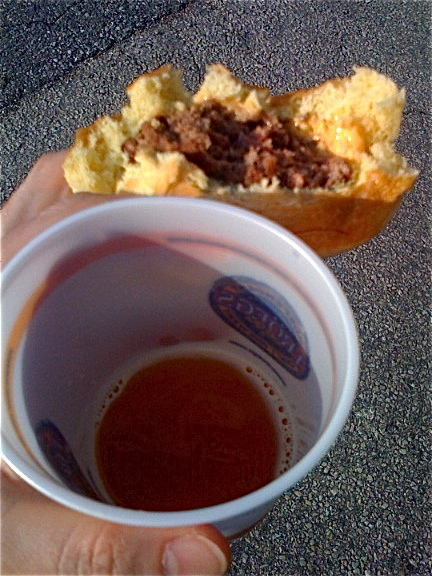 Served on a potato roll with a slice of american cheese, the Troegsburger delivered serious flavor, great juiciness and a dab of good karma knowing that the meat came from happy cows (I’d be very happy on a steady beer diet, too). The friends we were with all agreed, the Troegsburger was great. You might want to stop over to the Beer Yard and pick up a case of Troegs and ask them when the next time the BBQ will be fired up outside, you won’t be sorry. Send an email to info@beeryard.com to get your name on the email list for beer and burger news. ps: For the beer fans in the group, they had a special “Scratch” brew of a Grand Cru which was stunning. Perfect for summer sipping. Again, the bad news…you can’t get it. It was a single batch brew. The Troegenator (Double Bock) was really smooth for such a strong beer, and you can get it throughout the year.